Someone years ago planted an honest to goodness lemon tree in our yard years before we got here. It's a small skinny tree, but I've never see a yield like this from trees ten times as big. It's almost a shrubbery, it's so thin, but these grapefruit size lemons grow, more than 20 feet in the air. This time of year, it's yielding, but it's constant spring here, so it yields frequently. The problem is they are so high up in the air. So I bought a little 2 dollar basket, and put it at the end of a 10 foot dowel. 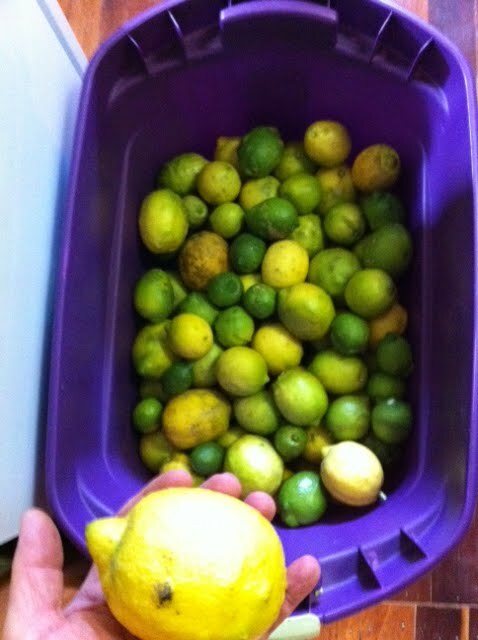 2 weekends ago I picked a few dozen lemons that were ripe. I didn't even scratch the surface. This tree is so skinny, my kids can't climb it because it would snap. Last saturday I took a dozen lemons from it. Still hadn't scratched the surface, because I couldn't get UP there to pick them. 2 - the way to get it to grow lower, was to trim the top, but then seal it with something so it doesn't rot. So today, me and the kids did Surgery. We cut off only 2 branches from up high, so that the smaller off shoots would yield lower next year. And then we picked all the lemons, ripe ones, and nearly ripe ones, from the fallen branches. As I did so, I sealed up the cuts, and noticed in one spot the skinny tree had strained in the weight of the huge lemons, and the wind, that it fractured, and had a bad case of rot inside. So we did surgery, and possibly saved the lemon tree's life. Now that I know how rare it is, I'll definitely be keeping good care of it. There has to be about 15 dozen lemons. I'm about to pull out the juicer and start freezing concentrate for lemonaide. When people come to our house, they get lemonaide. NOT muli juice, which is good but different. they take a sip, say 'AH!' and then say ,hey! that's LEMONAIDE! That's what me and the kids did today, at least for part of it.